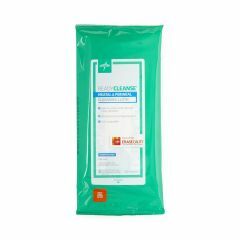 AllegroMedical.com presents READYCLEANSE Meatal & Perineal Cleansing Cloths. Specially designed for comprehensive meatal and perineal care to reduce the risk of developing a catheter-associated urinary tract infection (CAUTI). Our five cloth cleansing protocol follows nursing best practices for a compliance driven, standardized method for daily care of the Foley catheterized patient. Each package contains five 8" x 8" cloths pre-moistened with a pH-balanced, non-antiseptic formula for gentle cleansing.